Light Blue includes powerful email features that you can use to respond to enquiries, stay in touch with your clients, save time, and keep all of your communications together in one place. 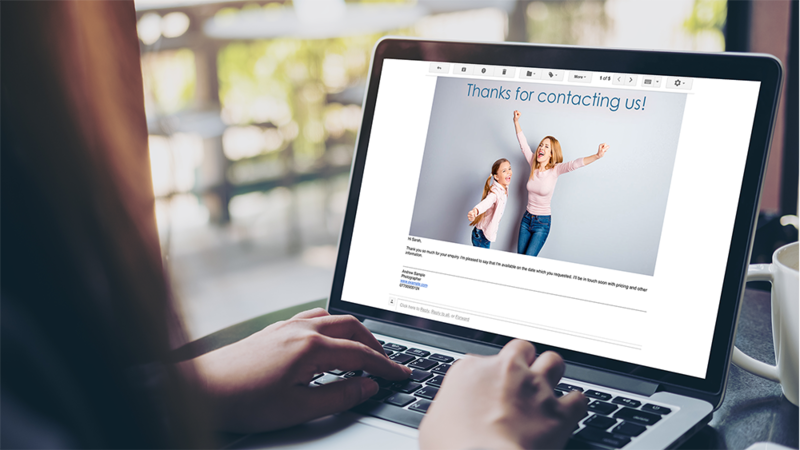 When a new enquiry comes in to Light Blue via email or your contact form, you can use an email template to craft the perfect response. Using a template saves you time (because you don’t have to type it out!) and makes sure that you don’t miss out any important information (because you crafted your email template in advance). 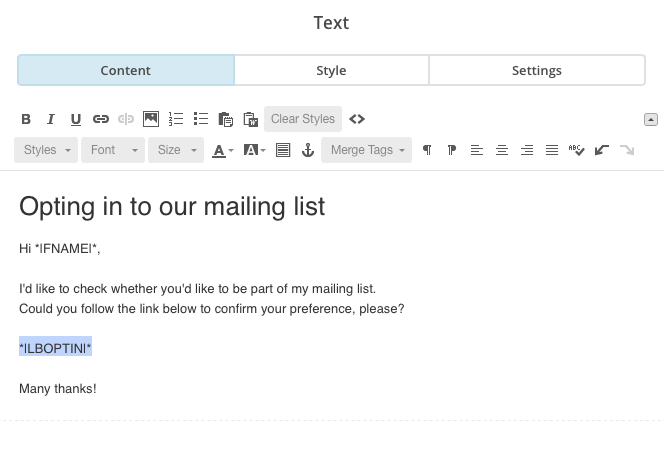 But Light Blue’s email templates also allow you to personalise your responses, using intelligent mail-merge tags that customise it with your client’s details and always allowing you to add your own touch to the message before you send it to your clients. 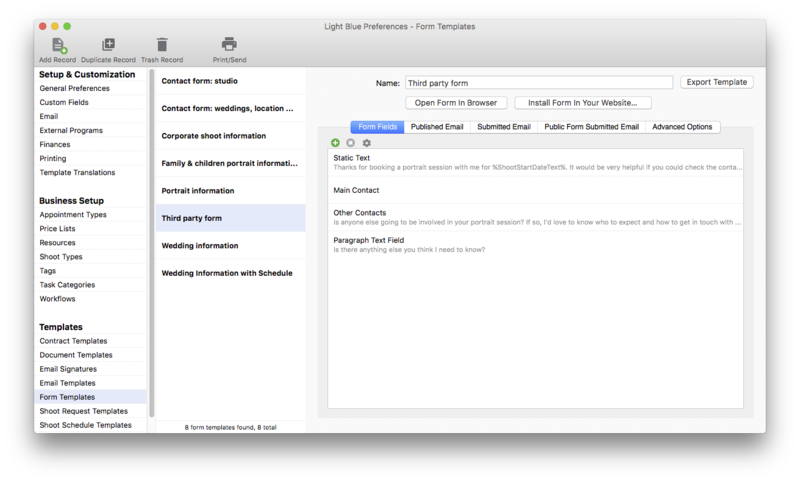 When you’re sending an email from Light Blue, we recommend that you send it from your own email account. Using your own email account looks professional and helps your messages to get through to your client. You can add as many email accounts as you like, and if you need a hand with setting them up then we’d be delighted to help. When a client replies to an email you’ve sent from Light Blue, the reply goes to your email address but it also appears in Light Blue’s Inbox. This makes it really easy to keep track of all of your communications with your client, because you’ll have copies of the emails you’ve sent and your clients replies in one place. This is especially useful if you’ve got more than one person working in your business, because the messages that your team are exchanging with clients aren’t spread out over lots of different systems. If you receive an entirely new email from a client (e.g. a new enquiry), all you need to do to get it to appear in Light Blue is forward it onto your unique @lightbluecustomermail.com email address. All of our subscribers get one of these special email addresses, and anything that you forward to it will appear in the Inbox. From there, you can turn it into a new enquiry and send a reply using one of your email templates. Light Blue 8 added lots of email and text messaging enhancements to Light Blue. As well as streamlining existing features, we added powerful automation tools that allow you to schedule messages to be sent to your clients. 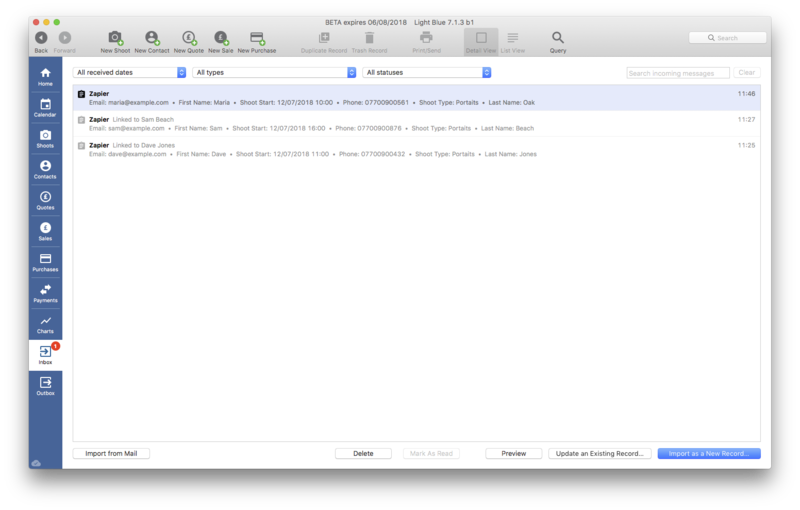 For example, you can set up automatic reminders that cut down on frustrating no-shows. You could also use an enquiry workflow to automatically send follow-up messages to a prospective client. We’ll be showing you how to set up and use all of these features in next week’s webinar, and we’ve also produced a series of helpful video tutorials that you can watch at any time. Sign up for the webinar at 13:30 GMT, Tuesday 19 February! We’re going to be carrying out some scheduled maintenance work on our servers this weekend, which is going to require some unavoidable downtime. We’re carrying out this work at 06:00 GMT on Saturday to minimise any disruption. We expect our servers to be offline for roughly 10 minutes. Because Light Blue’s desktop and mobile apps can be used without an internet connection, most of Light Blue’s features will continue to work during the downtime. Light Blue’s text messaging feature is popular with photographers all over the world. It allows you to stay in touch with clients, and to massively cut down on no-shows that cause your business to lose money and frustration for you! You can find out more about our text messaging service in this blog post. 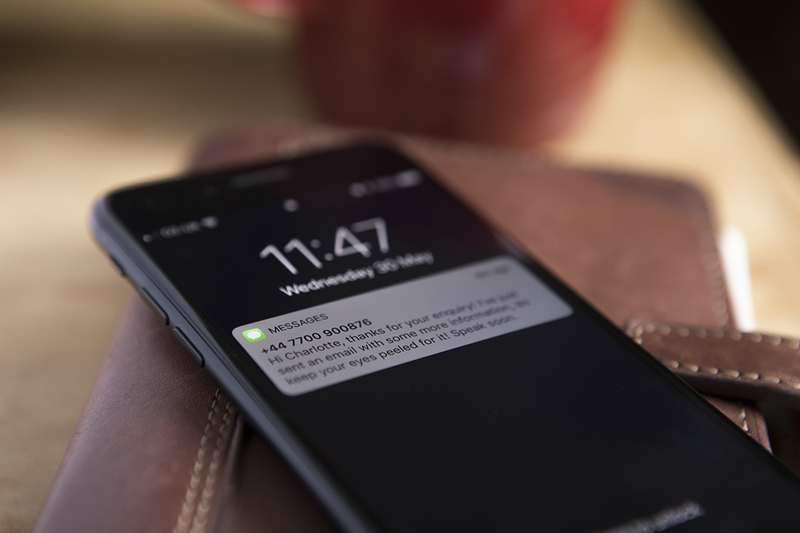 We’re delighted to announce a new feature for everyone who’s using our text messaging service: automatic top-ups for your text message credits. With this feature, you no longer need to keep an eye on the number of text message credits you have left. Just tell us when you’d like us to automatically top up your balance and we’ll take care of it for you. If you’d like to take advantage of this new feature, get in touch and we’ll set it up for you. Photographers all over the world are using Light Blue’s powerful forms to streamline their workflows, using them to feed new enquiries straight from their website into Light Blue. They’re really easy to set up and embed in your website, and you can also our forms as part of your online booking process. Light Blue also offers an API that gives you more advanced options for sending information to your Light Blue account. 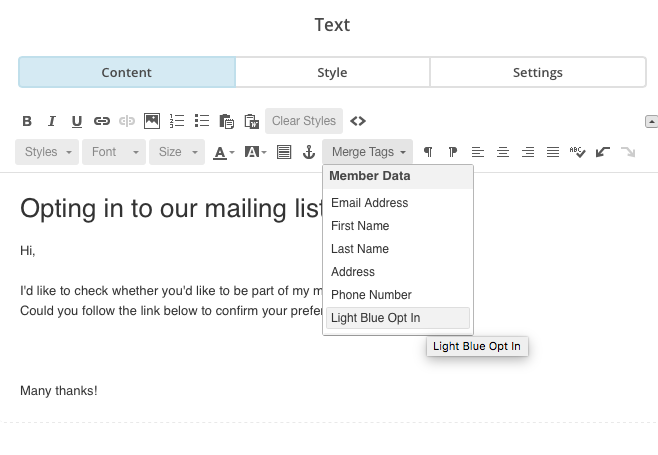 You (or your website designer) could use the API to link a customised contact form to your Inbox, or you could use in combination with Zapier to link a variety of other services to Light Blue. Using a powerful combination of our API and calendar publishing options, can be used to link Light Blue to popular online scheduling systems like Acuity Scheduling. Online scheduling tools like Acuity can allow your clients to book shoots online, based on your availability. The customer can choose their own session without needing any input from you, and the details arrive in Light Blue without needing to type anything in. This article focusses on how to set up an integration with Acuity using the middle-man service, Zapier, to send booking information into Light Blue for you. Once you’ve created and set up your Acuity account, you’ll need to be able to tell their system when are (and aren’t) available for bookings. There’s a couple of different ways that you can do this, either by publishing events from Light Blue to a Google Calendar, or to your iCloud account. You can then authorise Acuity to synchronise with that calendar. Any events that have been added to Light Blue (like other shoots, meetings & time off) will now block out time that could be booked in Acuity and show that you’re unavailable, so you don’t get double-booked. The next step is to link Acuity back to Light Blue, so that new bookings are sent to Light Blue using our API and integration with Zapier. Zapier is a service that acts as a middleman between a variety of web services, with some services providing triggers (e.g. “a new booking has been made via Acuity“) and other services providing actions. 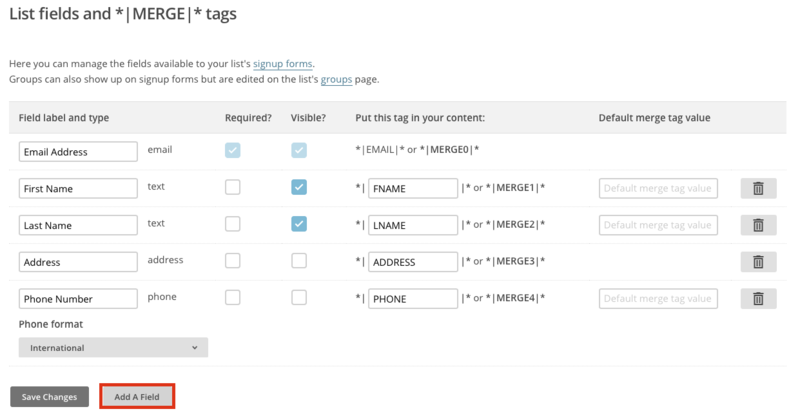 Zapier allows you to set up a number of “Zaps” that link a trigger to an action. 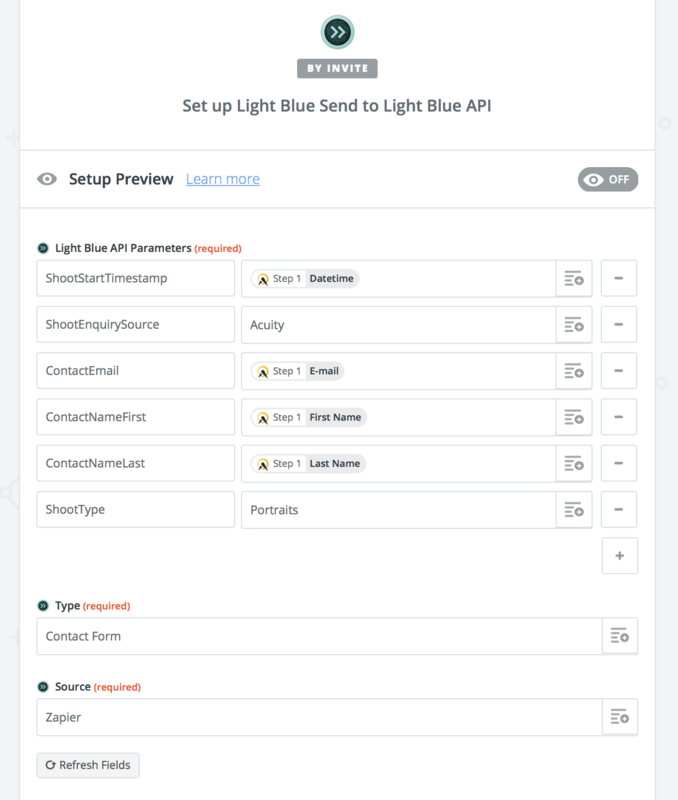 We’ve written a Zapier action that allows you to send information to the Light Blue API in response to one of these triggers. As well as a subscription to our online services, you need a Zapier account. Zapier offers a variety of subscriptions (including a free one) but please be aware that each subscription level will only handle a certain number of tasks per month. The first step in creating your “Zap” is choosing which app or service will trigger the Zap to start running. Choose Acuity Scheduling from the list of apps and enter your account details. When a new appointment has been created in Acuity, the Zap will be triggered. Now you can select Light Blue from the list of action apps. You might need to type “Light Blue” in the search field to find it. 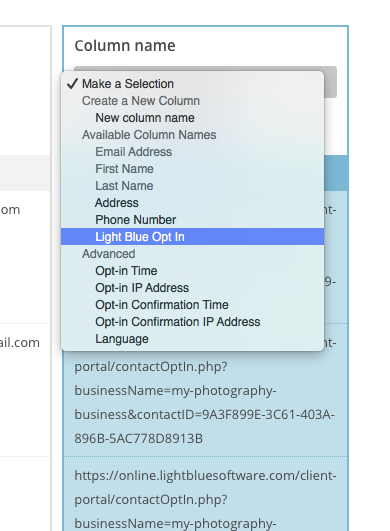 When you’re prompted to select a Light Blue account, enter your Light Blue API key. You can find your API key by logging into the My Account section of our website. Once you’ve set up the trigger app for your Zap and linked your Light Blue account to it, you need to associate data from the source app with parameters that the Light Blue API recognises. To do this, you need to fill in the ‘Light Blue API Parameters’ section shown in the screenshot below. You type Light Blue API parameters in the left-hand column and select items from the trigger app in the right hand column. You can use the + button to add extra items. You can find a list of the parameters that the Light Blue API recognises in the Supported Parameters section. You should leave the ‘Type’ and ‘Source’ fields alone. Different systems show dates and times in different formats, which other systems may not necessarily be able to read or understand. When adding the date and time for a shoot from Acuity to Light Blue, we’d recommend using the ShootStartTimestamp API parameter and linking it to the DateTime value from Acuity. Once you’ve linked your Zap to parameters that the Light Blue API recognises, Zapier will ask you to test and save your Zap. If any errors occur (e.g. you don’t provide any parameters that the Light Blue API recognises) then Zapier should inform you and display an error message that you can send to us for further help. If you’re having problems setting up your integration with Light Blue’s API, we’d be delighted to help you. The most useful thing to do is send some screenshots of what you’re trying to do and/or where you’re getting stuck. Screenshots of the settings you’re using in your Zap are most helpful! Light Blue’s online contract signing service is one of the most popular features of our online services. It’s really easy to publish contracts for your clients to sign quickly. You need to set up at least one contract template which contains your terms and conditions in order to send contracts to your clients. We don’t provide any sample contract templates with Light Blue, so you’ll either need to create your own, copy and paste the text from a contract that you already have in perhaps PDF or Word format, or obtain a contract template from a reputable third party. Only you can know if a contracts wording is right for you, so if you’re in any doubt then talk to a lawyer. You can create your own contract template within Light Blue by adding your own terms or copying and pasting the text from a contract that you already have. This tutorial walks through the steps of how to do that. 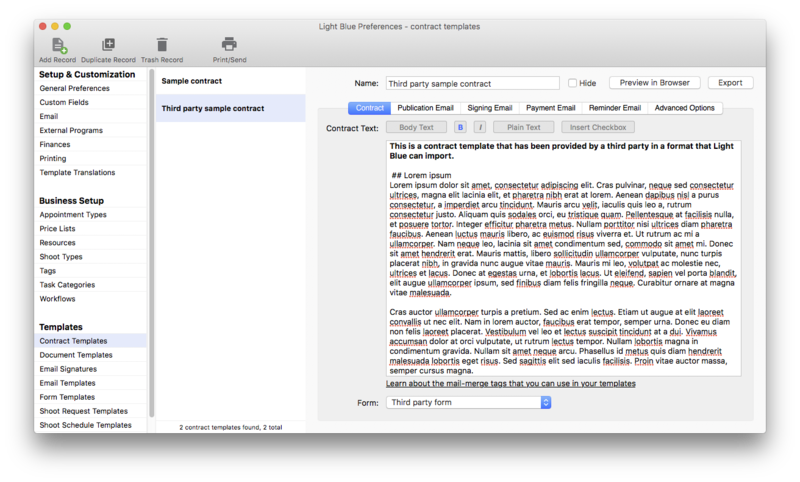 If you’ve obtained a contract template that’s been provided in Light Blue’s contract template format, it’ll be given to you as an XML file. 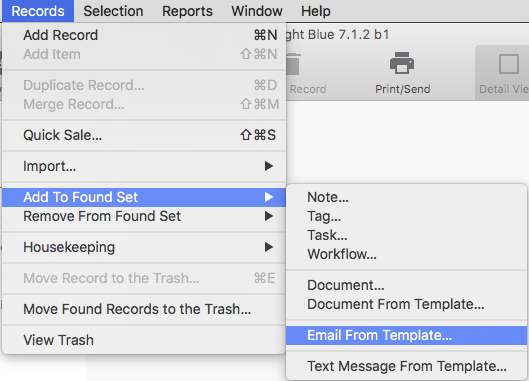 To import that into Light Blue (you need to be using Light Blue 7.1 or later), click Records > Import > Contract Template, and choose the XML file. If the contract template also includes an accompanying form template, you’ll be prompted to choose whether or not to import the form, too. You most likely do want to import the accompanying form. 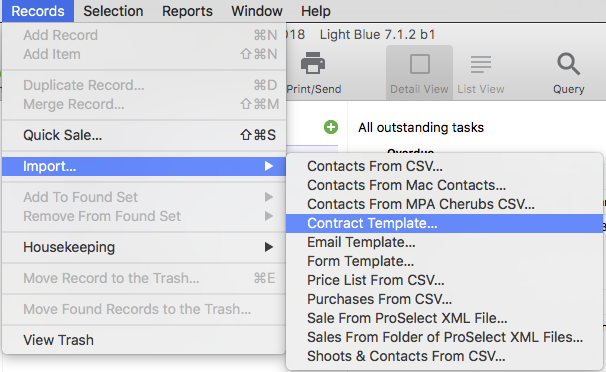 When that’s done, the contract template & form template (if you imported one) will appear in the preferences pane and will be ready to use. If you only want to send mailing list opt-in links to a small number of clients, you can use the %ContactMailingListOptInURL% mail-merge tag in an email template. 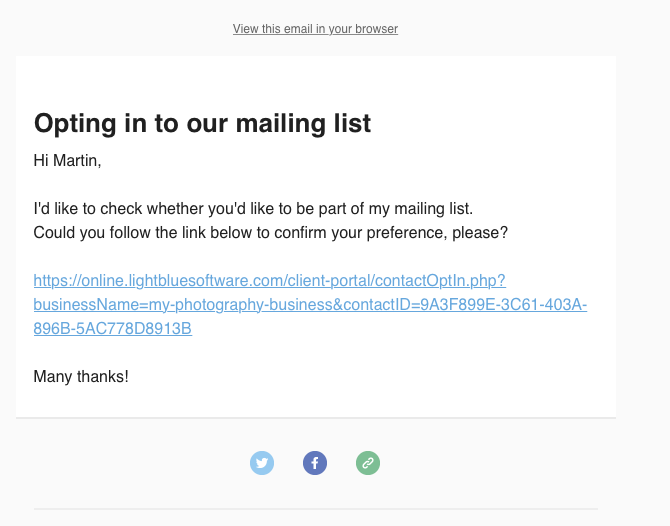 If you want to send mailing list opt-in links to lots of clients, you can export a CSV file of contact names, email addresses, and URLs from Light Blue. You can then import this spreadsheet into a service like MailChimp to email it to your clients. Your client portal branding is automatically applied to your mailing list opt-in form, and can customise the text that appears on the form by logging into your account on our website. Read on to learn how to use either of those methods of sending a mailing list opt-in form to your clients! If you want to email a small number of contacts, you could send an email to your clients using an email template. After you’ve queried for the records that you’re interested in, either by using the Query dialog or one of your Quick Queries, then you could send an email to all of those contacts based on a template that you’ve already set up. There’s a short tutorial covering how to create your own email templates here. 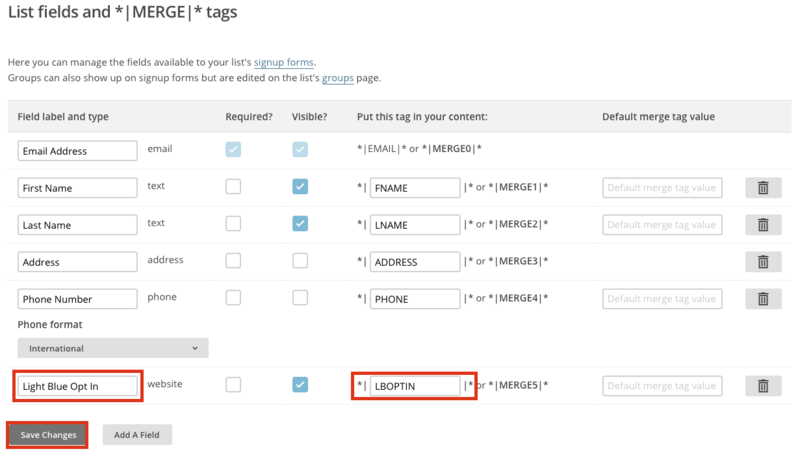 You’ll need to include the %ContactMailingListOptInURL% mail-merge tag in your email template, so that each contact receives their own unique link to the special opt-in page. It’s a good idea to try sending a test message to yourself first, to make sure that you’re happy with how everything appears & works, before sending it out to your customers. We’d discourage you from using this approach to send more than a small number of emails, because you can run the risk of your mail host temporarily suspending your account for sending too much mail or marking your address as a producer of spam. If you have a larger group of clients you’d like to invite to opt into your mailing list, we’d recommend using a service like MailChimp. 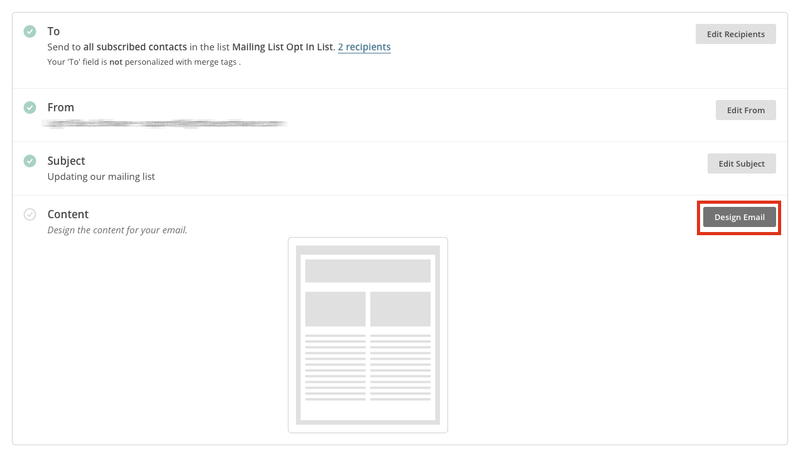 MailChimp is great for sending big mail-outs to lots of contacts. You can personalise those messages to include information that’s unique to each person, too. That means that you can include the unique URL that identifies each client in the email to that person. In order to do that, you need to add a list of contacts to MailChimp. The first step is to export your contacts’ names, email addresses, and the unique URLs that they can use to opt into your mailing list. 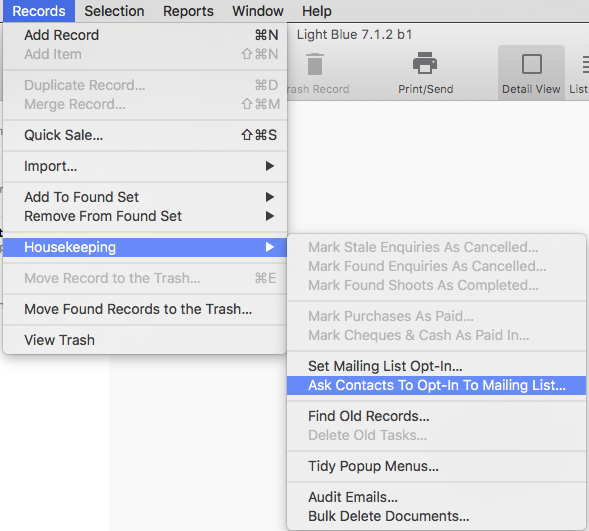 You should use the Query dialog or one of your Quick Queries to find the contacts that you want to include in this mailing, and then go into the Housekeeping section of the Records menu and select ‘Ask Contacts To Opt-In To Mailing List’. Light Blue will give you a preview of the contacts who will be included. You can remove contacts by selecting them and clicking the ‘Remove From List’ button. 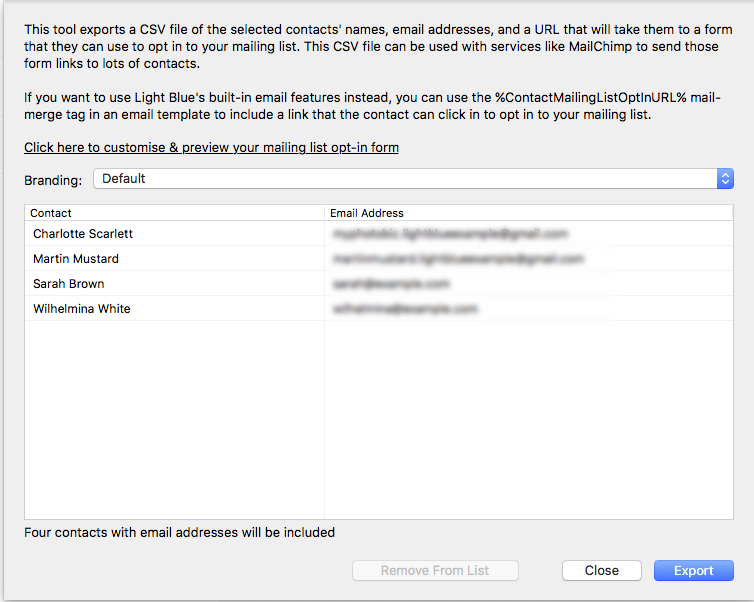 When you click the ‘Export’ button, Light Blue will export a CSV file that you can import into MailChimp. Log in to your MailChimp account and then, in the Lists section, click ‘Create List’. Give the list a name and complete the other required information, then save the list. 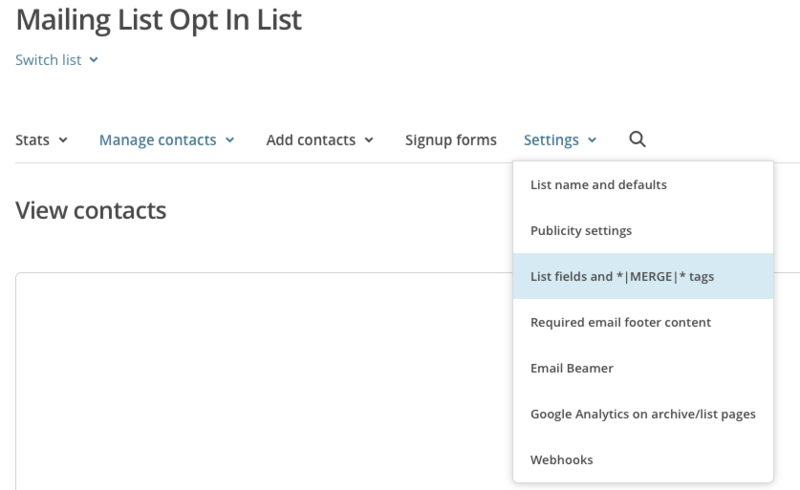 You don’t need to include the “Enable double opt-in” or “Enable GDPR fields” options for this list: the purpose of messaging contacts on the list is to ask them to complete their unique opt-in form which will update Light Blue. Choose the file that you exported from Light Blue. 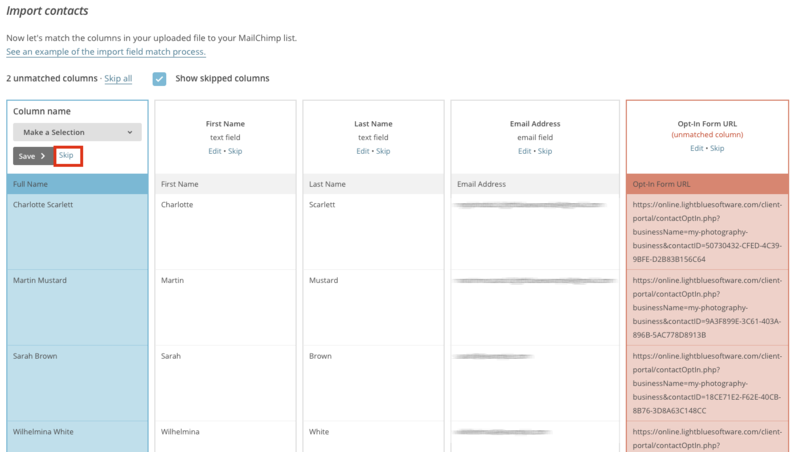 Now you can map the columns in the CSV file to the relevant MailChimp fields. Click Save, then click Next. 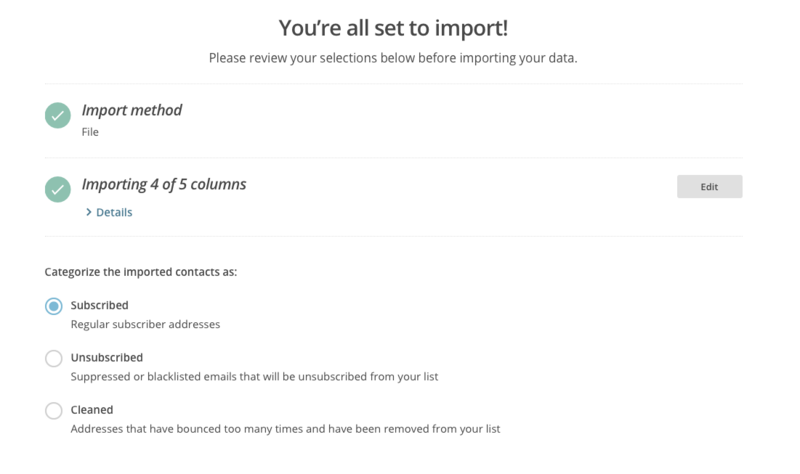 When you click Import, MailChimp will import the contents of the CSV. 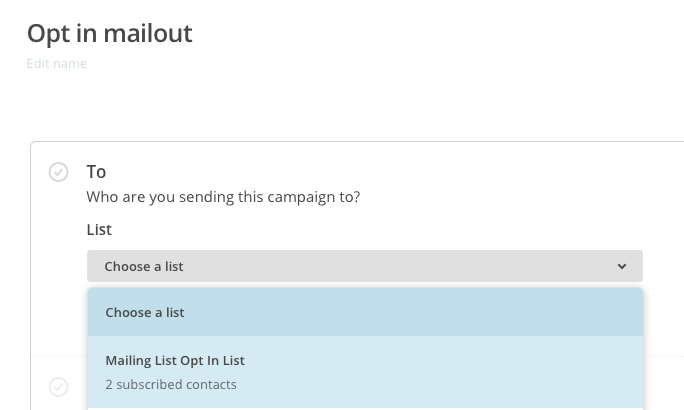 You can now create your email message which will be addressed to the contacts in this list by creating a new email campaign. To do that, return to your MailChimp account home screen and click the “Create Campaign” button. Enter relevant “from” & “subject” fields, then click on the “Design Email” button to design the content of your message. Choose a layout format that you want to work with and start to compose your email message. Click on the text of your email, choose to edit the text block. Once you’re done, click “Save & Close”. You can send a test message to preview how the email looks. When you’re ready, click the “Send” button to send the email to all of the contacts that you imported. Whether or not you want to receive a notification email whenever a client opts in or out of your mailing list via this form. The heading and text that appears on the form. The text of the buttons on the form. The headings and text that appears on the pages that are displayed when a client opts in or out. We’re going to be carrying out some essential maintenance to our servers over the Easter weekend, and this will cause a short amount of downtime for our online services on the morning of Sunday 1 April (and, no, this isn’t an April Fool). Because Light Blue is desktop software that you can use offline, most of you won’t even notice that our servers will be offline for a few minutes. You’ll be able to carry on using almost all of Light Blue’s features, and any changes that you make while our servers are offline will automatically be synced up to our servers as soon as they’re up and running again. However, our online contracts, forms, and invoices will be unavailable during the downtime. We’ll be carrying out this maintenance early on Sunday morning, and our servers should unavailable for no more than a few minutes. The new ClickBook system has been integrated directly with Light Blue, so ClickBook v2 bookings will appear directly in your copies of Light Blue when you sync it to our servers. Using ClickBook with Light Blue requires you to be using Light Blue version 6 or newer, and to have a subscription to our online services. 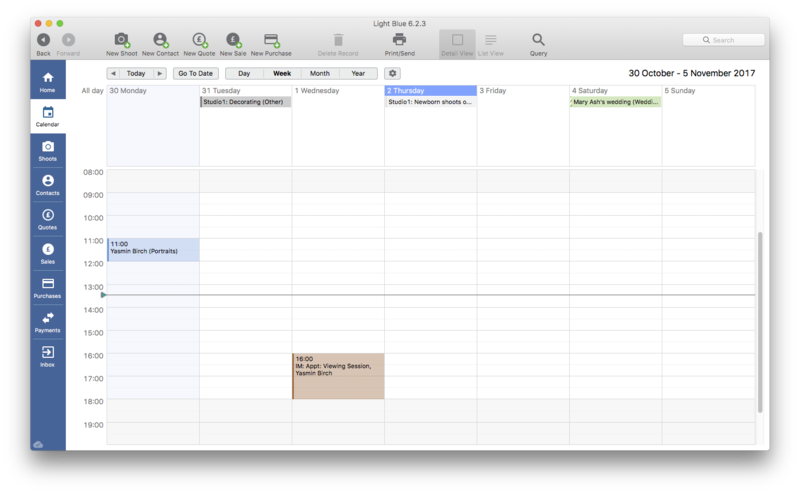 Light Blue doesn’t use Google Calendar to send your availability to ClickBook v2, instead we use our own API to do that. In order for Light Blue & ClickBook to communicate, you need to give ClickBook your Light Blue API key, which you can get by logging into your account page. ClickBook v2 already contains a link to the member area on the Light Blue site to allow users to set up their API key. Within Light Blue we have the concept of “resources”, which covers rooms, staff and equipment. ClickBook takes the list of rooms that you’ve set up in Light Blue and presents them to the people who are going to be booking in sessions for you, so you need to set up at least one room in Light Blue. There’s a short tutorial which covers everything you need to know about resources. 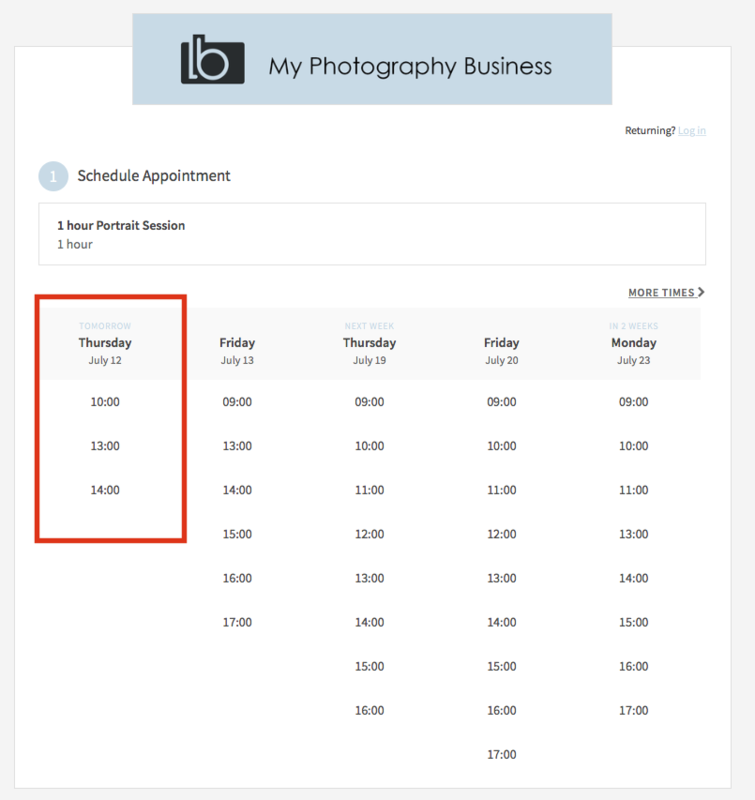 In order to accurately display your availability to ClickBook, you need to make sure that you’ve added all of your shoots, appointments, and time off into Light Blue for the relevant dates, and assigned the appropriate resources to those shoots & appointments. Events that don’t have any resources assigned to them will block bookings for your entire studio. – A shoot/appointment with the relevant room resource (e.g. “Studio”) linked to it: ClickBook will not be unable to book jobs that require that room for that time. You can also use Light Blue’s calendar notes to present information to ClickBook (e.g. a note saying “Newborns only today”). Whenever Light Blue is running and you’ve got a connection to the internet, Light Blue will automatically sync with our servers once a minute. If, for whatever reason, you want to force Light Blue to sync with our servers right away, you can do so by clicking File > Sync Now. If you need any help with setting up your ClickBook v2 account, there’s a tutorial video from Feedzon which you can watch, here. If you’re switching over from using TPO, we’ve got some more information on how you can arrange to have your TPO data imported into Light Blue, here. In order to support some new features that we’re working on at the moment, we need to make some changes to the servers that run our online services. We’ll be carrying out these updates early on Saturday and Sunday to try and minimise any disturbance to our online services. The only part of our online services that will be affected is data synchronisation from our desktop and mobile apps to our online services. All other features (including existing forms, contracts, and online invoice payment) will be unaffected, but anything that depends on our desktop and mobile apps communicating with our servers (e.g. sending a text message, or publishing a new contract) might be affected. We’re going to try to keep any disruption to a minimum, but data synchronisation might be offline for parts of the time between 05:00 – 09:00 BST on both Saturday and Sunday. Update: there won’t be any disruption to our online services on Sunday morning. We’re going to be taking advantage of the bank holiday weekend here in the UK to make some updates to our servers on Monday morning. Most of you shouldn’t notice any problems, and of course your Light Blue desktop and mobile apps will continue to work offline, but there might be some interruptions to our data sync service.